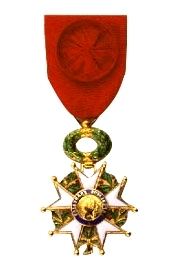 The Legion of Honour (French: Ordre national de la Légion d'honneur) is the highest French award. It was established by Napoleon Bonaparte on 19 May 1802. The Order is the highest decoration in France and is divided into five degrees: Chevalier (Knight), Officier (Officer), Commandeur (Commander), Grand Officier (Grand Officer) and Grand Croix (Grand Cross). The order's motto is Honneur et Patrie ('Honour and Country'), and its seat is the Palais de la Légion d'Honneur on the left bank of the River Seine in Paris. This page was last changed on 21 December 2018, at 17:38.